This article compares Unified Modeling Language tools. Astah Yes Unknown Yes Unknown Java, C++, C# Java, C++, C# Mind Mapping, ER Diagram, DFD, Flowchart, CRUD, Traceability Map, Requirement Diagram and Requirement table. Provides API and Plugins, RTF, HTML Export. ATL Yes No Yes No Unknown Unknown Available from the Eclipse M2M project (Model to Model). Can transform UML & EMF models into other models. It has a repository of transformations called ZOO about a large set of common industrial concerns and educational labs. CaseComplete Unknown Unknown Export Unknown Unknown Unknown Unknown Provides management and editing of use cases, their flow of events, and referenced requirements. Supports use case and activity diagrams. Eclipse UML2 Tools Yes Yes Yes Yes Java (or Eclipse project supported?) Java (or Eclipse project supported?) Eclipse Ten UML 2 diagram types. Enterprise Architect Yes Yes Yes Supports MDA templates and Code Generation templates ActionScript, C, C#, C++, Delphi, Java, PHP, Python, Visual Basic, Visual Basic .NET, DDL, EJB, XML Schema, Ada, VHDL, Verilog, WSDL, BPEL, Corba IDL ActionScript, C, C#, C++, Delphi, Java, PHP, Python, Visual Basic, Visual Basic .NET, DDL, XML Schema, WSDL Eclipse & Visual Studio UML 2.5, SysML, BPMN, SoaML, SOMF, WSDL, XSD, ArchiMate. Frameworks: UPDM, Zachman, TOGAF. Forward and Reverse Engineering for code and Database. Model Driven Integrated Development (Edit/Build/Debug) for Java, .Net, PHP & GNU compilers. Simulates Activity, State Machine, Sequence and BPMN diagrams. Gliffy Yes Unknown Unknown Yes Unknown Unknown Google apps, Google drive, JIRA, Confluence Has libraries of shapes for: UML class, sequence, activity, use case and more. LucidChart Unknown Unknown Unknown Unknown Unknown Unknown Google Drive, Google Apps, JIRA, Confluence, Jive, and Box. MagicDraw Yes Yes Yes Yes Java, C++, C#, CIL, CORBA IDL, DDL, EJB, XML Schema, WSDL Java, C++, C#, CIL, CORBA IDL, DDL, EJB, XML Schema, WSDL Eclipse, EMF, NetBeans UML 2.3, Full round-trip support for Java, C++, C#, CL (MSIL) and CORBA IDL, Report generator from template in RTF, HTML, XML, ODT, ODS, ODP, and Text (DOCX, XLSX, PPTX since 16.8). Modelio Yes Yes Yes Yes Java, C++, C#, XSD, WSDL, SQL Java, C++, C# Eclipse,EMF Full UML2,BPMN,Documentation generation in HTML.Extensions providing documentation generation in Open XML format, support for TOGAF, SysML, SoaML, Hibernate, OMG MARTE standard. Support of model fragments for collaboration. Support of design patterns. NetBeans Unknown Unknown Unknown Unknown Java Java Unknown Has to be installed as a plug in to enable the UML modeling. PlantUML Yes Unknown Export Unknown Unknown C#, grails, Java, Lua, PHP, SqlALchemy Chrome, Word, Open Office, Google Docs, J2EE Servlet, JQuery, Sublime, Eclipse, NetBeans, IntelliJ, LaTeX, Emacs, Doxygen, etc. Creates diagrams using simple text language. Sequence, use case, class, activity, component, state, object, and UI mock diagrams are supported. Outputs images in PNG or SVG format. PragmaDev Studio Unknown Unknown Import Unknown C, C++ Unknown RTOS: VxWorks, FreeRTOS, ThreadX, CMX, OSE Delta, OSE epsilon, uITRON 3, uITRON 4, Nucleus, posix, win32. Debugger: gdb (GNU Debugger), Multi (Green Hills Software), Tornado (Wind River), Tasking Cross View Pro (Altium). Dedicated to modeling and testing of real time and embedded systems. Based on ITU-T Z.109 UML profile, SDL-RT, SDL. The model can be simulated and can be exported to model checking tools. Full testing environment integrated based on TTCN-3. ↑ "ArgoUML". ArgoUML. 2011-12-15. Retrieved 2012-01-23. ↑ "BOUML - an UML tool box". 2012-03-07. Retrieved 2012-03-07. ↑ Toto, Serkan. "Collaborative Diagramming Tool Cacoo Goes Freemium, Adds New Features". TechCrunch. Retrieved 2016-11-17. ↑ "Eclipse UML2 Tools". Eclipse.org. 2007-08-24. Retrieved 2011-10-12. ↑ "UML modeling dropped as of v6.8". Retrieved 2013-04-23. ↑ "Product History". Retrieved 2013-09-05. 1 2 The UMLet Team (13 November 2016). "UMLet - UML Tool for Fast UML Diagrams 14.2". eclipse.org. ↑ "yWorks News". yWorks. 2015-07-16. Retrieved 2016-08-03. ↑ "Running". PlantUML. Retrieved 2014-11-06. ↑ "How to import XMI files into yEd?". 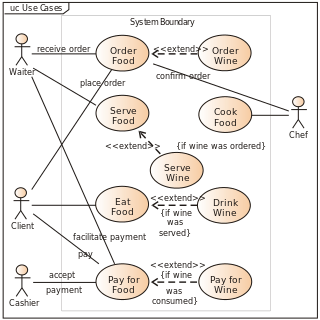 Wikimedia Commons has media related to UML tools. UML CASE Tools UML CASE Tools Listing.